Welcoming 3 bedroom holiday home to sleep 5. 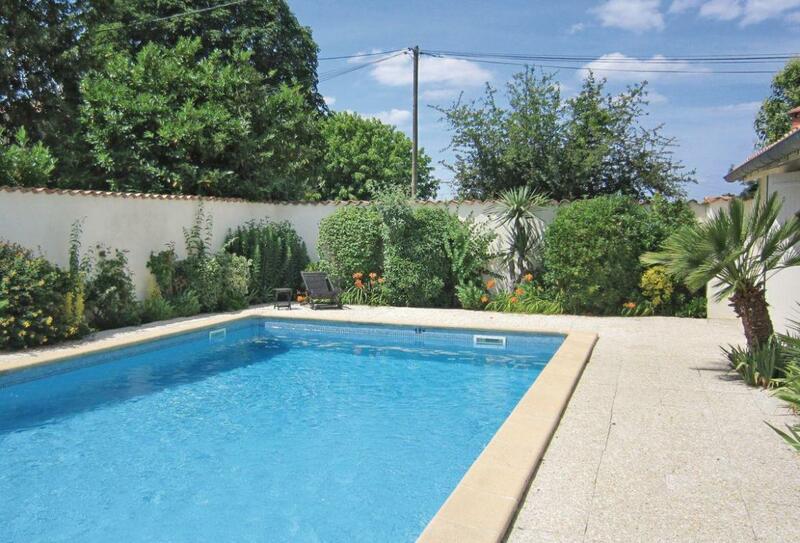 Ideally located near Blaye, Aquitaine. This holiday villa offers a brilliant private pool to relax, play and soak up the sun! Airport within 1 hour. Pets not accepted. This beautifully restored country home is set in flower filled gardens and is the private winter residence of a family of antique lovers. Its thick stone walls ensure it remains cool in the hot summer months and it has a large enclosed sunbathing lawn with mature trees, a fish pond and even a lovely summerhouse. To the rear is the superb swimming pool with high walls surrounding the patio area, making this a great sun trap. This area, the Gironde, is one of the most important and prestigious wine producing regions of Europe, boasting countless world renowned appellations such as Côtes de Blaye, Bourg and St. Emilion. All fabulous places to tour around and try new wines. Nearby is the fortified Citadelle de Blaye, while the more adventurous can climb the massive dunes at Pyla (Europe’s highest), or watch the surfers in delightful Cap Ferret or Arcachon. Just 30km from Bordeaux with its abundance of historical monuments and museums. Spacious living room with antiques, stone fireplace. Dining area. Small retro-style kitchen. Pool-side sitting room with sofa bed. Two double bedrooms, one on pool-side with en-suite WC. Single bedroom (with doors to terrace and pool). Bathroom. Shower room/WC. Large garden with pond, patio, outdoor swimming pool (10m x 5m, depth 1-1.8m, open Jun-Sep weather permitting) with Roman steps, washing machine, dishwasher, on road parking, garden furniture, barbecue. No children under 8 years.